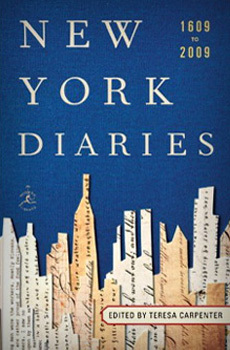 from New York Diaries 1609 to 2009. p. 163. 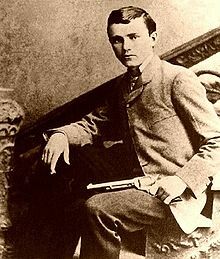 …The news that Jesse James is still alive is very thrilling news to me, and my mother too, but we’ve noticed that it doesn’t seem to impress the New York world at all — which does bear out, in its own way, what I say about New York, that it is a haven for European culture and not American culture. 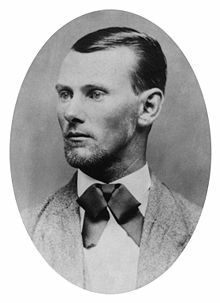 I don’t get personally mad at these things any more, because that is overdoing things in the name of culture and at the expense of general humanity, but still, I get personally mad at those who scoff at the significance of Jesse James, bandit or no, to the regular American with a sense of his nation’s past. Reality check. Jesse seems to have been born in 1847 and died in 1882 at the age of 35. Kerouac’s calculations would make him about 101 at the time of his death – unusual longevity for an outlaw. As for his significance to the nation’s past, there’s some disagreement. There can be no doubt that brothers Frank and Jesse James captured the popular imagination in the late 1800s when penny dreadfuls published in the East popularized the exploits of bandits in the West. Most of these accounts bore little resemblance to actual events, but it didn’t matter. Outlaw tales usually contained strands of truth and out of these, legends were spun. The James brothers, hailing, as they did from Missouri, a border state during the Civil War, claimed partisan loyalty to the South. They were, in fact, “bushwhackers”, who found it as convenient to rob Southerners as Northerners, depending upon the valuables at stake. Trains were the main prize as they carried payrolls, and the Jameses with their motley crew – the composition was ever-changing – were perceived by an alienated western public as striking at big railroad interests of the Northeast. Robbing banks was trickier to justify as the haul contained the life-savings of widows. Although the brothers styled themselves as modern-day Robin hoods, there was no evidence to suggest that they shared their loot with anyone. A Missourian myself, I’ve had long-term familiarity with the basic legend. But an unfamiliar DVD on turned upon on on the stack of DVDs by our TV. 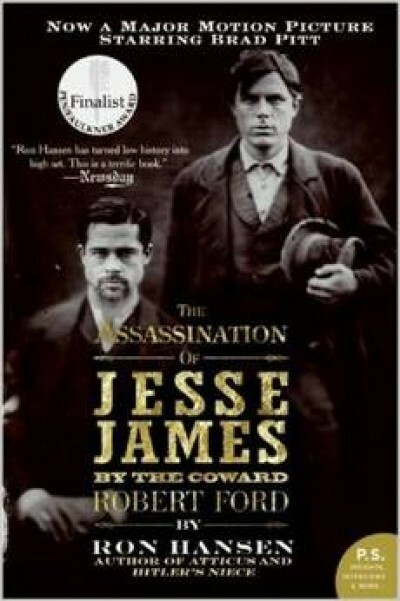 It was The Assassination of Jesse James by the Coward Robert Ford, starring Brad Pitt. (A 2007 release.) Both my husband and son assured me that it was a “cult classic.” So I watched and, unexpectedly, it blew me away. What a socko set of performances! The film begins with the gang’s robbery at Blue Cut, just a hair above Independence, Mo. (My hometown.) And the rest of the film is a psychological contest between Jesse and the nervy, neurotic kid Ford who can’t decide whether he wants to be Jesse or kill him. Ford is played by Casey Affleck so perfectly, his mask-like face conveying passion and desperation with the twitch of a muscle, he haunted my dreams for a week. Parts of the film are voice-over, usually annoying, but the writing seemed so evocative that I looked up the author, Ron Jansen, and bought his book, by the same title, available in paperback. It is a rich and satisfying read. In fact, I wish I had tapped the book first, because once you see Brad Pitt as Jesse, you’ll never be able to imagine the outlaw as anyone else. In written form, it’s the peculiar details that fascinate. The historical Jesse, who lived under the alias “Howard”, was actually a good-looking guy, if his photos are any indication. But he reportedly remedied the odor of rotting teeth with licorice and candy. Possibly TMI. There’s a perception gap between gritty literary history and a film with the production values of Days of Heaven. In this case, each works so well on its own terms, I think may be one of the best adaptations I’ve come across in a long time.